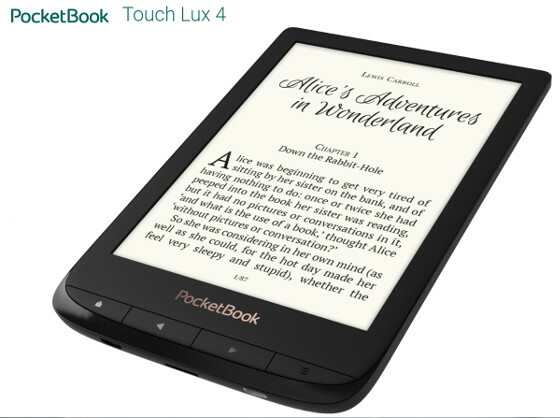 Pocketbook has announced the upcoming release of two new Pocketbook ebook readers, the Touch Lux 4 and Basic Lux 2. Pocketbook offers a wide variety of models. These two new devices don’t have any cutting-edge features but they have an interesting design with page buttons below the screen and they’re very lightweight at just 155 grams. Both have 6-inch E Ink Carta screens with 212 ppi, and both are equipped with frontlights. The Touch Lux 4 has a touchscreen but the Basic Lux 2 does not. Both have 8GB of internal storage space and Pocketbooks are about the only ereaders left with microSD card slots. They both have a 1GHz processor. The Touch Lux 4 has 512MB of RAM and the Basic Lux 2 has 256MB of RAM. Both have Wi-Fi and micro USB ports. Pocketbook’s device support a wide range of formats, including PDF, EPUB, DJVU, FB2, FB2.ZIP, DOC, DOCX, RTF, PRC, TXT, CHM, HTM, HTML, and MOBI. Too bad Pocketbooks aren’t sold in anywhere in North America. Sometimes they can be ordered from international sellers on eBay and Amazon but the prices are a lot higher than domestic models. Walmart Now Selling eBooks and Kobo eReaders, But What’s With the Phony Reviews? No eReader should have 212ppi in 2018. No device period should have 256mb of ram in 2018. I think a long book would cause it to crash. Poor specifications. 212ppi. 256 ram. 512 ram. 1 ghz. Better options onix boox, boyue t62, likebook air, kobo. I don’t buy it. They need offer some better specs for ti be more competitive. This is E Ink we’re talking about here. The specs aren’t all that important if the software is optimized well enough. Battery life is probably better because of it. And both of these are ten times nicer than the entry-level Kindle. Heck, I’d even rather have a device like the Touch Lux over the Kindle Paperwhite because I’d rather have page buttons and a trim, light design than 300 ppi. I have Pocketbook Inkpad3, and I LOVE IT! If I had the money, I would give away my Kindle Paperwhite and order this one the first day in sale. Even better specs for those who needs it. But it isn’t a smartphone or tablet we are talking about. It’s an eReader! I hate that I have to sideload books from Amazon to read them with PAGENUMBERS on my Kindle Paperwhite. And use Calibre to remove the protection on the books. Only use I have of owning a Kindle, for the serial number. It’s easy to download the books from Amazon webpage, and they are yours for ever, not as long as Amazon let you read them, or close your account. Yes, it have happened to several people. They lost all their books. Locked in Amazon, you only lease the right to read your books, but you don’t own them. I love Pocketbook, and you can order from their webpage, no ebay needed. I did, my eReader was sent the next day. Unfortunately there is no option to order from Pocketbook’s website in the US. I own a Pocketbook Inkpad 3 that I don’t use. It’s basically brand new. If anyone is interested, I could sell it for 250 US$, shipping included (from Canada). I’ll enven throw in a cover. You are right. I apologise. I am one of the (possibly literally)dying breed who STRONGLY prefer the apparently now passé, increasingly scorned 6 inch form factor. So I was very interested in the Lux 4, despite the difficulty in obtaining one, and the high cost once shipping up here to Aotearoa is factored in. I am much less keen now that I know it’s only 212 ppi. Thank you for this information, Nathan – it is conspicuous by its absence on the Lux 4 specs page at pocketbook’s site. I have owned a PocketBook and 3 Kobo ereaders and they are great for reading outside and are lightweight. I now use my Samsung tablet (Android 8.2) It is heavy and difficult to use outside BUT I can get books from Kindle, Kobo, Gutenberg etc and most importantly, I can borrow from my local public library. No ereader to date can do this using CloudLibrary to which my library is committed. There is no way I could afford to buy all the books I read. I had hope for the latest Kobo but they tell me that CloudLibrary and of course Kindle are off limits. Kindle is totally locked into selling their own books. Onyx can run Overdrive but not later versions like Libby or CloudLibrary. Until I find an ereader that can run those apps I guess I’ll have to stick with my tablet unless someone produces a remote ePaper screen for my Pixel phone. Does it have PDF reflow?